With just four ingredients – okay, five if you spike it with your favorite rum – this Crock Pot hot spiced apple cider couldn’t be any easier to make. It’s the perfect excuse to get out there and rake the leaves. It’s fall, you say? Wait. Wait just a second. Grab an orange. Stick some cloves in it. Throw it in your Crock Pot along with a few cinnamon sticks and a bottle of apple cider. Turn it on. Wait four hours. 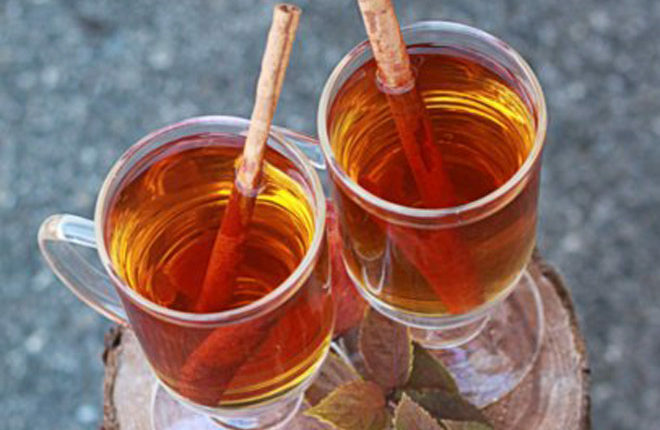 Have you ever wondered, “How do you make mulled cider?” Well, you just learned how! 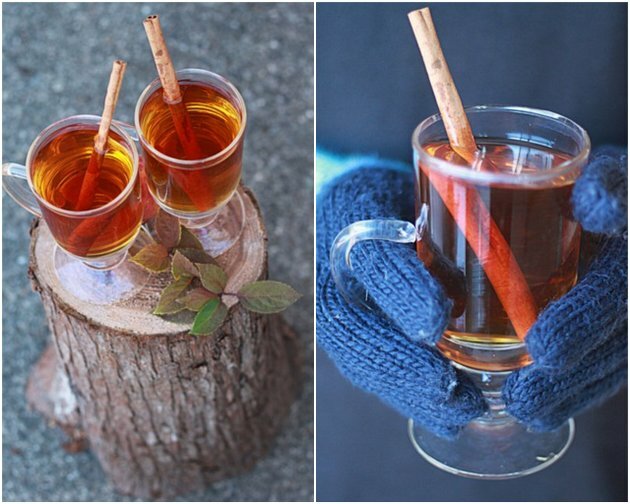 Now you have hot apple cider in your warm little hands. And NOW it can be fall. Not only is this Slow Cooker Hot Spiced Apple Cider recipe seriously that easy, it’s also quintessentially autumn. Mulled cider looks like fall. It tastes like fall. It makes the entire house smell like fall. 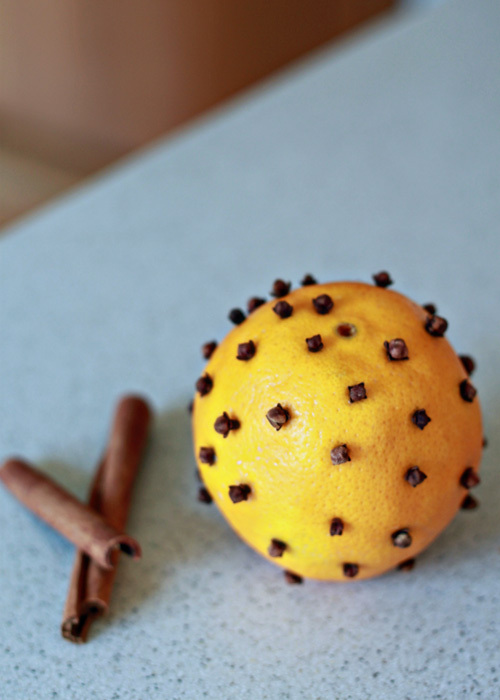 My favorite part about this mulled apple cider recipe is the orange. It just looks so festive, and tiny amount of orange juice that comes out, the oils from the peel, and the cloves impart the most wonderful, heady flavors – both into your cider and in the air. Hot spiced apple cider is seriously the ultimate air freshener. 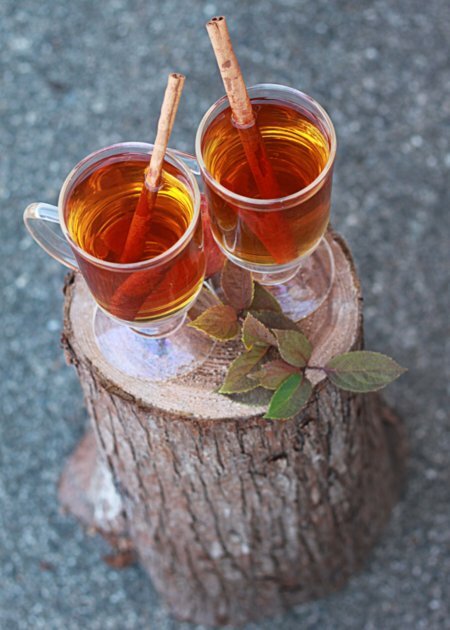 This hot apple cider warms you up after an hour or two of kicking around in the fall leaves or picking out that perfect pumpkin or trick-or-treating on a perfectly frosty night when you can see your breath. And for the adults, you can add a perfect extra little warming factor: RUM. I know, I know, by now we’ve all seen a gazillion hot spiced apple cider recipes. But this mulled cider, I think, is special because it takes only four whole ingredients – no special mulling spices required. Plus, it utilizes that wondrous kitchen appliance – the slow cooker – so you don’t have to stand over the stove or worry about keeping it at the perfect temperature once it’s ready to be served. It just sits there on your kitchen counter, being awesome, until everyone happily drinks it all down. Yep. Bring it on, fall! Pour apple cider into a 2.5-quart or larger Crock Pot or other slow cooker. 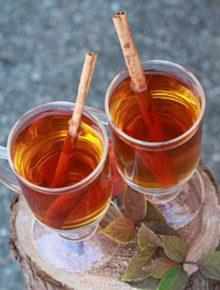 Add cinnamon sticks to cider. I just made this today and it’s amazing! It’s cheap too! I was able to make this for my husbands whole shop, he’s a mechanic, and it was gone within 5 minutes! Love it! 🙂 And doesn’t it just make the whole house smell awesome?! Once prepared can you leave on a low temp in the slow cooker for long periods and it will stay warm and not boil? Hi Steven, yes, that works for me! Might depend on your own slow cooker but with all of mine (Crock Pot brand) it stays just warm enough w/o boiling. I plan on preparing this before a client party, which will be about three hours long. Should I take the orange out if it will just be kept warm for the three hours? Will leaving the orange in over “spice” it? Thank you so much! Now the four hour cooking time, is that a strict cooking time or can it be on for a little less before serving? It can absolutely be a little less (hope my reply isn’t too late!) You can even warm it on the stovetop first if you’re in a crunch – much faster – then just keep it warm in the Crock Pot. Can I reuse this again for 3 days?? …if it’s not all gone, that is. ??? Can you use apple juice instead of apple cider? Yes, juice will work, though I prefer cider! Does it work to cook for 4 hours the evening prior, and then re-heat it when needed? Serving it at my 10:00 a.m. garage sale and do not want to get up at 6:00 a.m.! Thanks. If I double or triple the recipe, do I really need to put 3 oranges in full of cloves or do you think less will still flavor the cider? Can brandy be cooked in crockpot along with other ingredients or does it have to be added separately to each drink? Can I use a pot on the stove instead of a crockpot? If so how long does it need to cook? Should it boil first? Could i add cranberry juice to this recipe? Is still or sparkling cider used in this recipe? Would sparking work? Hi Jess, I use still cider. I’m not sure how sparkling cider would work. It would definitely lose its carbonation. If you try it please report back! I have some older cinnamon sticks. Is it okay to use those. Just not sure how long spices and specifically cinnamon sticks are good for. I’m sure they’re fine. Maybe add a couple of extra just to make sure? Some spices do lose their oomph after awhile but I’m not sure how long cinnamon sticks will last. Do you peel the orange first?